My husband and I finally got to visit Melrose Market in Seattle’s Capitol Hill neighborhood and check out Rain Shadow Meats, The Calf & Kid and the new Sitka & Spruce. 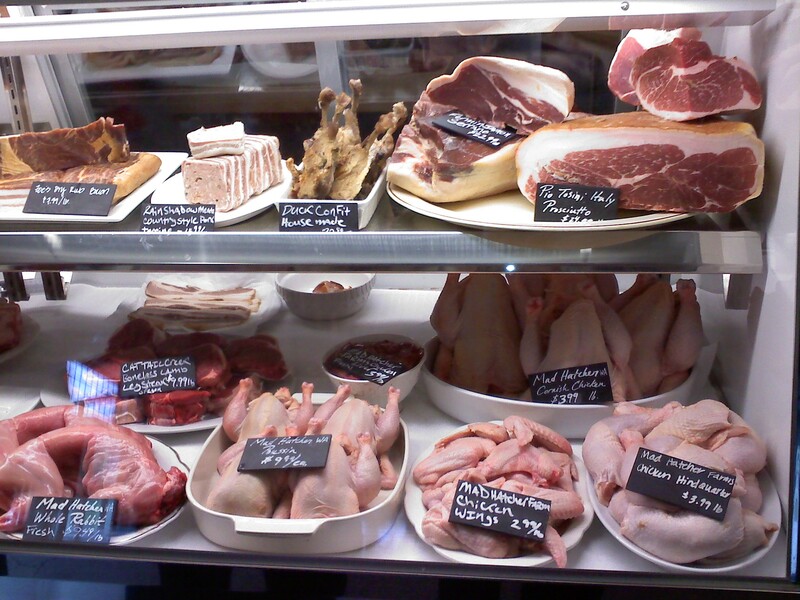 The butchers at Rain Shadow Meats had an impressive display case that included whole rabbit and house-made duck confit. I like the simple sign with “Established 2010.” It gives the appearance of longevity, and then you realize 2010 is now. 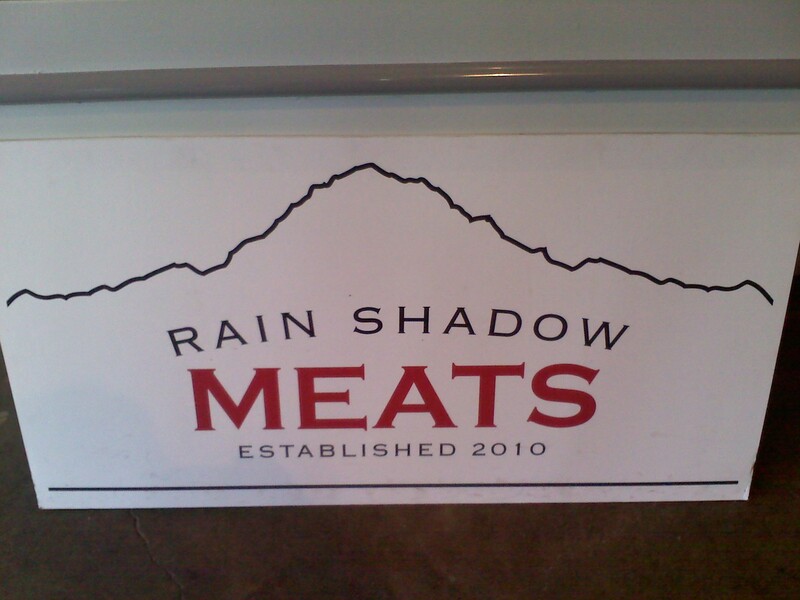 According to its website, Rain Shadow Meats will offer classes in meat and butchery. Sign me up! If I’m going to be a carnivore, I should know more about what I’m eating and how to best prepare it. Across the way from the butcher is The Calf & Kid cheese shop. Since my husband and I could easily (and happily) spend a whole week’s pay on good cheese, we didn’t linger long, but I could tell even after a quick visit that The Calf & Kid is a cheese lover’s dream come true. The shop sells lovely things to go along with cheese, such as preserved lemons and olive oil crisp bread. I was very excited to read on the CHS blog that Homegrown Sustainable Sandwich Shop will be opening a location in Melrose Market and will be using meats and cheeses from Rain Shadow Meats and The Calf & Kid. Homegrown is scheduled to open June 22. I never got to eat at the old Sitka & Spruce, but I’ll make sure I don’t make the same mistake twice. I’m definitely going to have a meal at the new Melrose Market location. The restaurant’s large open kitchen melts into the dining area and makes it feels like you’re at someone’s house. 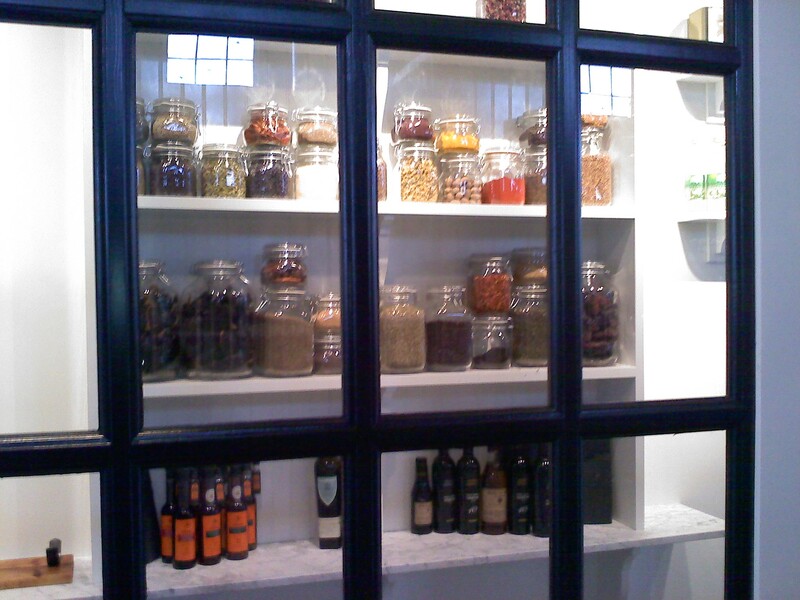 Here’s a peek inside the Sitka & Spruce pantry. I’m already impressed with Melrose Market and can’t wait to see what’s next. When I was a kid, my family rarely went out to dinner. We almost always ate at home. Even if my parents didn’t cook, we would get takeout instead of going somewhere. On the rare occasion that we would go to dinner, we would wind up at Royal Fork, the local buffet restaurant. My older brother and I loved Royal Fork because we got to eat “American” food that our Filipino parents rarely or never made–things we only saw on TV. Thursday night dinners at my friend Ellen’s house are alive and well. I just haven’t had time to write about any of them! So this post is going to be about a dinner we had in January. Ellen loves shabu-shabu, the Japanese version of hot pot, which basically involves cooking thinly sliced vegetables and meat in a bubbling pot of broth right at your table. Then you dip the cooked meats and vegetables in ponzu or sesame sauce and eat everything with rice. When all the meat and veggies are cooked, Ellen likes to throw in some noodles in the end. I’ve personally never understood how she still has room to eat this, but the broth is super flavorful and makes for extra good noodles. 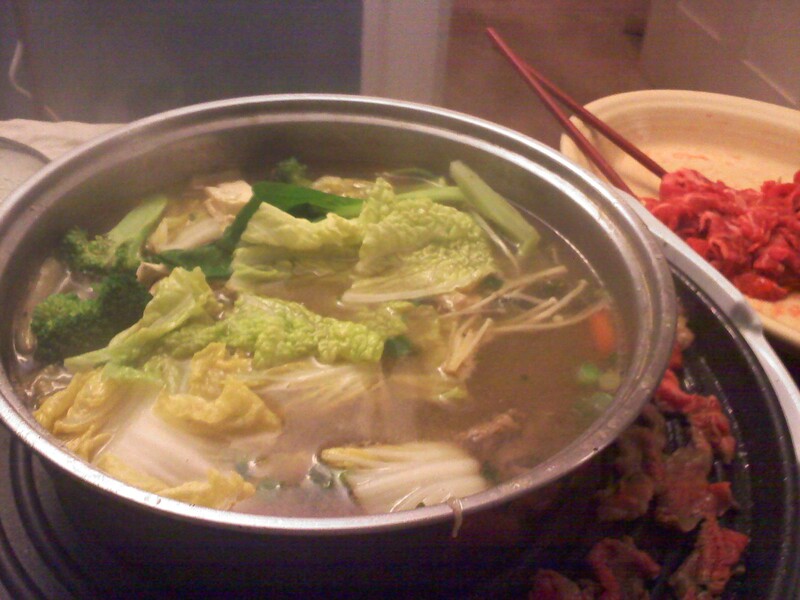 Shabu-shabu is a Thursday night staple and is particularly good during winter (although with Seattle’s temperate climate you can eat it all year long). We were all set to do it when Ellen got the call that her pregnant sister was going into labor. Lynn stepped in and said she would host the dinner, which was great. There was just one problem. None of us had done shabu-shabu without Ellen. We are a resourceful group of ladies though and decided to press on. Lynn and I went to Uwajimaya to buy thinly sliced beef, green onions, Napa cabbage, bok choy, broccoli, carrots, enokitake mushrooms and tofu. Gathering the vegetables was easy enough, but buying the meat was a little more challenging. How much thinly sliced beef to buy for five people? We consulted with the butcher and wound up getting four packages of meat since the Thursday night group is a bunch of hearty eaters. Both Lynn and I had almost a nervous breakdown in Uwajimaya’s noodle aisle. As you might imagine, the Asian grocery store had hundreds of varieties of noodles, and we couldn’t find the ones that Ellen had put on her list. We talked to several Uwajimaya employees, but we still couldn’t figure it out so we decided to forego the noodles. 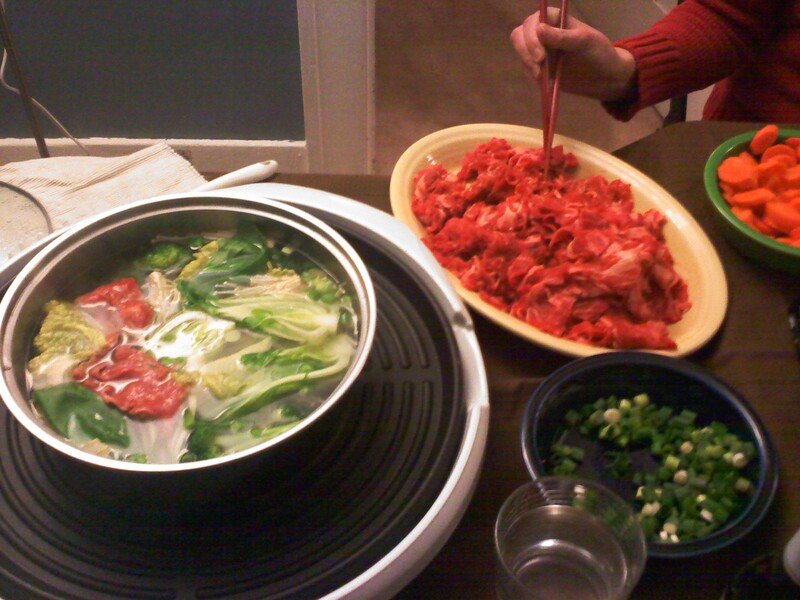 At Lynn’s house, we got everything ready to go into the pot. And then we got to cooking. 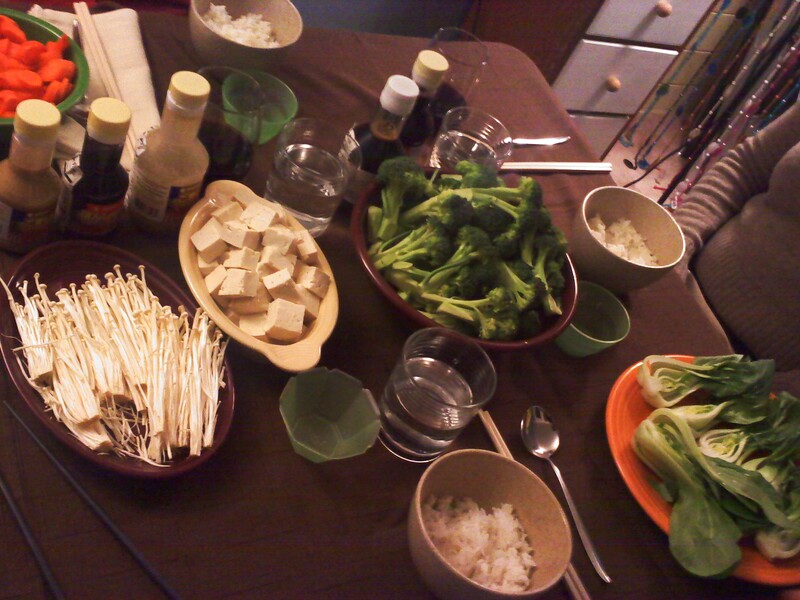 I think the strongest appeal of shabu-shabu is that it’s pretty hard to mess it up. Mahnaz suggested that we put some of the meat directly on the heat source for the shabu-shabu pot to essentially grill it. This is something Ellen never does, but we tried it, and it was delicious. 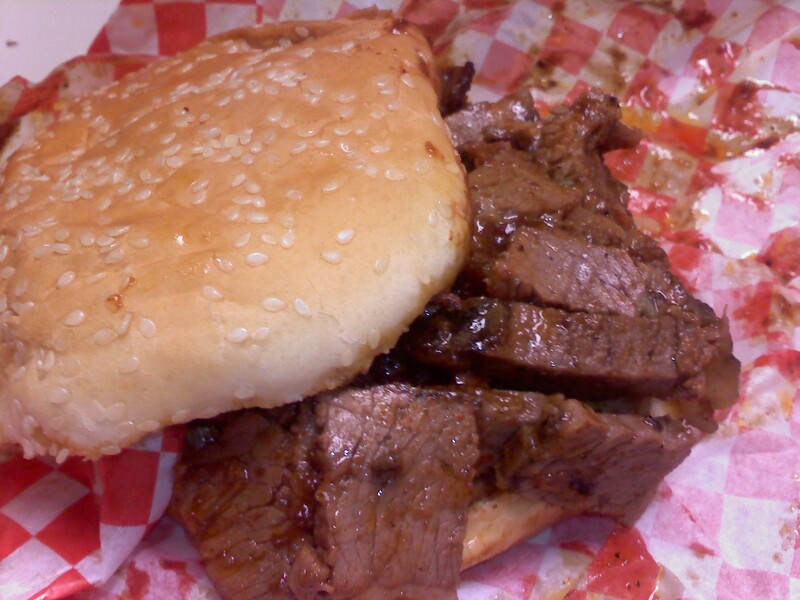 In honor of National Brisket Day, I went to Chuck’s Hole in the Wall BBQ to get a beef sandwich and a side of baked beans. Hole in the Wall BBQ is a sweet little lunchtime spot in Seattle’s Pioneer Square neighborhood that delivers an ode to meat every weekday from 11:00 a.m. to 2:00 p.m. True to it’s name, it’s a small space with very limited seating and usually a long line that snakes down a hill. 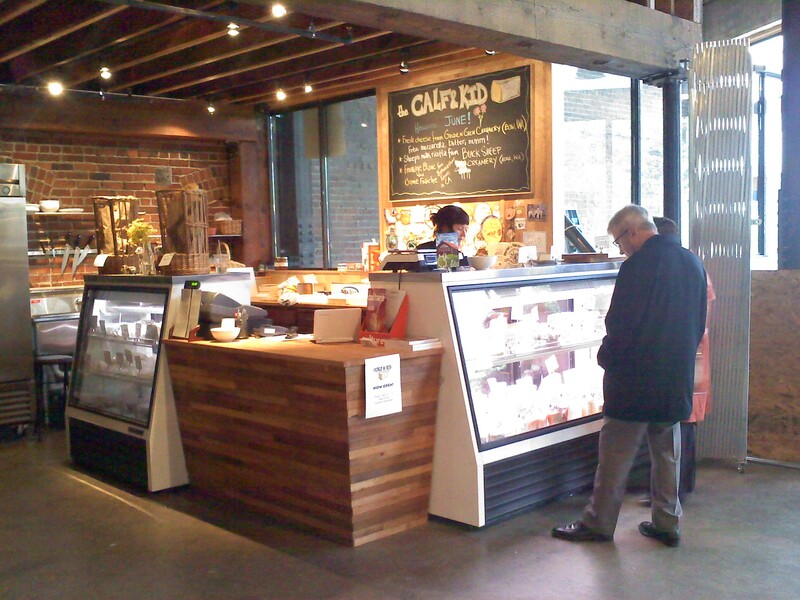 No worries though–service is fast and friendly and allows downtown workers to make the most of their lunch hour.